New Zealand became the first men's side to win consecutive Rugby World Cup Sevens titles as they beat England 33-12 in the final on Sunday. This year's tournament saw the traditional round-robin stage scrapped in favour of a single-elimination knockout from the opening round of matches. Australia were a notable first-round casualty in the men's draw while England's women fell at the first hurdle in a surprise defeat by Ireland. "We're getting a lot of positive feedback from fans about the drama of knockout," said World Rugby chief executive Brett Gosper, as 102,000 fans attended the event over the three days of competition. "It makes each game exciting. It can be brutal for teams, but sport's brutal." 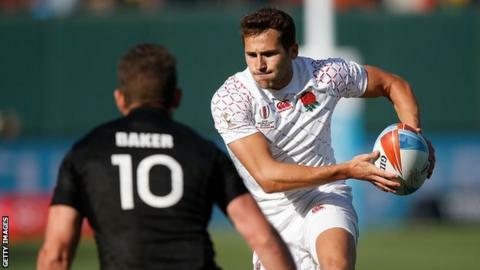 England head coach Simon Amor said he was "pleased" with how his players adapted to the new structure, but captain Tom Mitchell claims he is "not totally sold on the new format". "There are pros and cons to it but it's up to World Rugby to keep mixing things up and keep improving the game," said Mitchell. Despite retaining the title in the men's and women's tournament, New Zealand coach Clark Laidlaw also remains unconvinced. "As a spectacle I'm sure everyone enjoyed it, but when you've got coaches and players' livelihoods at stake, and the format isn't quite what we're paid to do, it's an interesting question," said Laidlaw.